United Way Suncoast is pleased to announce our 2019 Tax-a-thon! In addition to preparing tax returns, this will be an all-around Financial Stability Event. The goal is to promote savings among adults by getting them to pledge their refund. We will also promote youth financial literacy with a space to keep children entertained while parents have their taxes done, The Kids Corner. United Way Suncoast partners will provide services such as opening banks accounts, credit counselors providing scores, community resources such as Low Income Taxpayers Clinic, and partners from the Economic Prosperity Center. United Way Suncoast’s VITA Tax-a-thon will take place at Hillsborough Community College (HCC) Dale Mabry on Saturday, February 9th 8:00 am – 8:00 pm, located at 4001 W. Tampa Bay Blvd, Social Science Building, 2nd Floor, Tampa FL 33614. 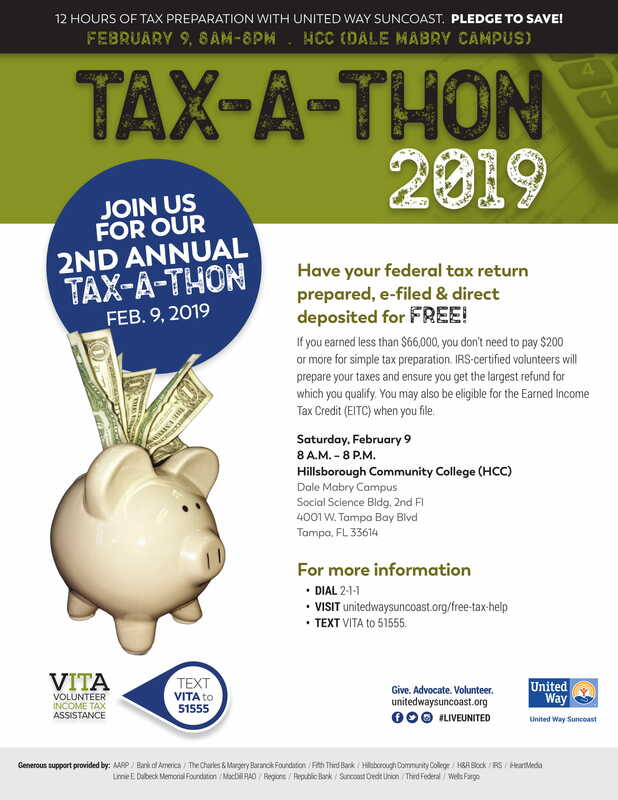 If you would like information and have other questions regarding our VITA Tax-a-thon, please do not hesitate to contact Margie Perez, 813-274-0920, mperez@uwsuncoast.org.